Last night I ran a Knit-In workshop at the Pamper Evening held at Horse Carrs in Rochdale. On the craft table were bags containing a pair of knitting needles, a ball of wool and a pattern to make a simple garter stitch square. The idea was that you could knit as little or as much of a square as you wanted too, then someone else could continue where you left off. Everyone seemed to love it. The idea came from when I went to The End of the Road Festival last year, where there was a similar workshop. In the time given, we may end up with only half a dozen squares completed but it's better than none at all. But what will I do with these squares when they're finished? Well, my lovely friends at Stitched Up in Chorlton are holding a Knit-athon at the end of the month (You can read all about it here!) 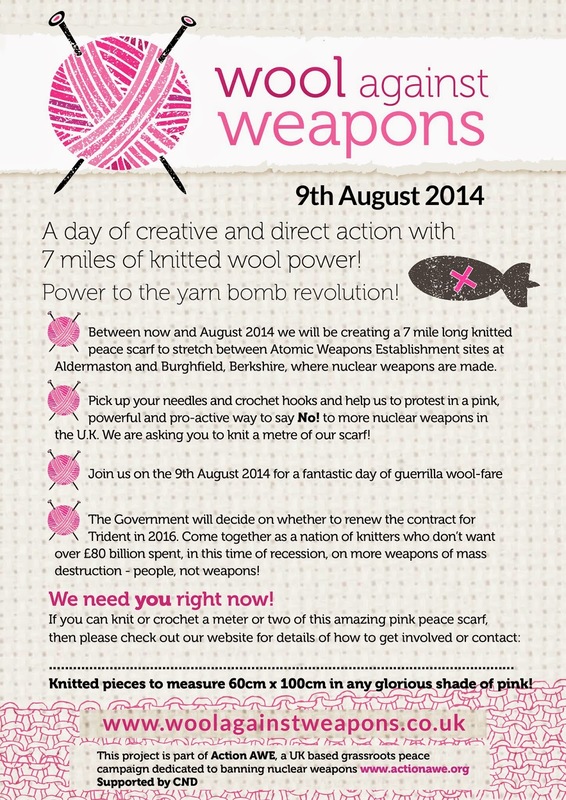 and I'm going to give them our contribution to add to theirs, which will then be sent to Wool Against Weapons who are making a huge 7 MILES LONG SCARF, which you can read all about in the flyer below. What it doesn't say in the flyer is that after the protest, the scarf will be re-purposed into blankets and distributed to those who will need them most. So nothing will go to waste. I think it's an amazing way of raising awareness. Thank you to all the lovely ladies, who took part last night!! !